Big Money Heavyweight is the fifth and final studio album by hip hop duo Big Tymers. It was released on December 9, 2003, through Cash Money Records and was mainly produced by Mannie Fresh, with other production handled by R. Kelly, Jazze Pha and Leslie Brathwaite. The album debuted at number 21 on the Billboard 200 with first-week sales of 116,000 copies in the US and was certified Gold by the RIAA. ↑ Jason Birchmeier (2003-12-09). 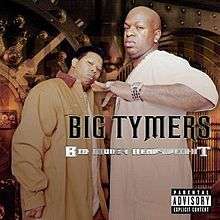 "Big Money Heavy Weights - Big Tymers | Songs, Reviews, Credits". AllMusic. Retrieved 2016-04-09. ↑ "Big Tymers: Big Money Heavyweight". PopMatters. 2004-03-17. Retrieved 2016-04-09. ↑ "Feature for December 16, 2003 - Big Tymers' "Big Money Heavyweight"". Rapreviews.com. 2003-12-16. Retrieved 2016-04-09. ↑ Brackett, Nathan; Christian Hoard (2004). The Rolling Stone Album Guide. New York City, New York: Simon and Schuster. p. 394. ISBN 0-7432-0169-8. ↑ "Musiq's 'Soulstar' shines; Setzer's 'Daddy' is all grown up". Usatoday30.usatoday.com. 2003-12-08. Retrieved 2016-04-09. ↑ "Studdard Takes 'Soulful' To No. 1". Billboard. 2003-12-17. Retrieved 2016-04-09.